Tom Tienor walks along a row of cows eating at Riverside Dairy in Cato. MILWAUKEE -- Gina Stokes says she will keep fighting for her family’s dairy farm, where the cows have names, not numbers, and the land tugs at her heart. “There is no better place to raise my family,” Stokes said about her farm, near Omro, Wis., that she and her husband, Dan, have with their four children. 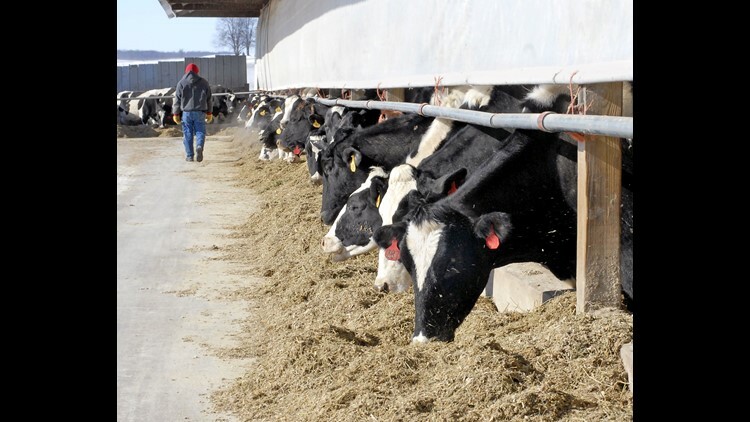 Last month, more than 50 groups from across the country — including the Wisconsin Farmers Union, Family Farm Defenders and the National Family Farm Coalition — asked Congress for emergency relief from the deepening troubles on small dairy farms. 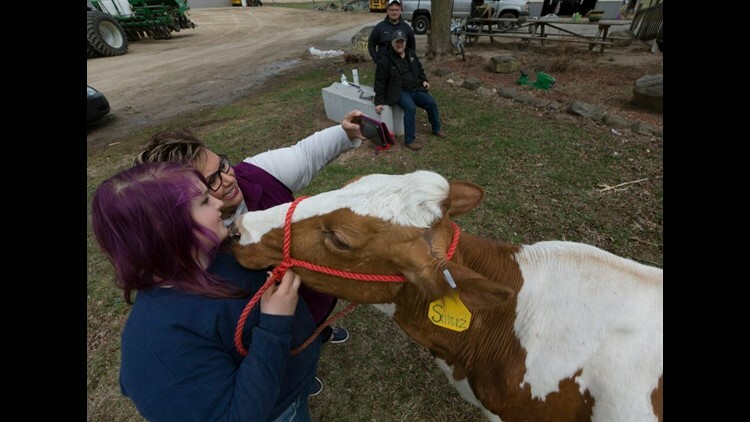 Gina Stokes makes a photo of her 14-year-old daughter, Sidni, and their dairy cow Smorz while her husband, Dan, and son, Spencer, look on at their farm in Omro. All the animals in their herd have names instead of numbers that many dairy farmers use. “What you are going to find here is love. You are going to find animals that are treated like our children and that get more pampering than the adults on this farm,” Stokes said. "If I have to cut back on something to make sure the bills are paid, and say a few more prayers, that's what I'm going to do because I am a lifer in this business." The situation has become so dire that dairy marketing cooperatives have started providing suicide hotline information to members along with milk checks. Yet critics say the proposals being put forth to save family diary farms could make matters worse. “I have always felt that the market is the best way to sort out the amount of milk required,” said Mike North, president of Commodity Risk Management Group in Platteville, Wis. But Canada has its flaws, too, said Gordon Speirs, a former Canadian dairy farmer who now milks about 2,000 cows in Brillion, Wis.
“We are just too damn good at what we do, as an industry,” said Speirs, who is on a committee of farmers advising Edge Dairy Farmer Cooperative in Green Bay, Wis.
“We have non-farm income to keep us afloat, so far. But it feels like we’re one bad decision, or one bad weather event, from falling off the edge,” said Randy Wokatsch, a dairy farmer near Wausau, Wis.